Music has been all around her since birth, but it was in 2013 that singer-songwriter-multiinstrumentalist Anna Myrsten released eight of her songs as ”Woodpecker” to raving reviews. Reine Fiske (Dungen/Anna Järvinen/Landberk) who became an instant fan at a gig plays electric guitars on the record. As a profilic figure on Stockholm’s music scene she has don…e some great gigs opening for Donovan, Fairport Convention, on the afterparty of The Soundtrack of our Lives’ farewell gig and on Sweden Prog Fest 2013. All the rabid genre labellers out there might put AnnaMy in the psych-folk-pop box if they must. Her music is mostly centered around acoustic guitars and bittersweet, heartfelt vocal arrangements with hints of artists like Linda Perhacs, Nick Drake, Renaissance, Jethro Tull and Crosby Stills & Nash. 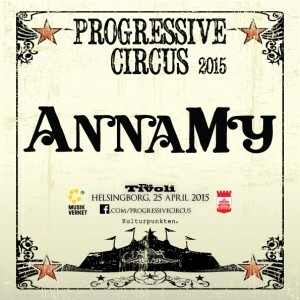 On PC15 Anna will do an intimate acoustic performance together with Caisa Ami Saxerbo Sjöberg (backing vocals) on the Circus stage. It will be magic so DO NOT MISS!! !